I love going to the cinema and when I was back in the UK I used to go at least once a week, I had a Cineworld unlimited card (otherwise I would have been broke!) I also like going to the cinema on my own, I felt really self conscious the first few times but seriously you should try it, it’s great! Now don’t get me wrong I enjoy the company of other people but there is just something so lovely about seeing a film on your own. I find it really relaxing (true story, I’ve often been so relaxed during some films that my Fitbit has tracked my cinema visit as a nap!) The reason I like going to the cinema on my own is that I find I can just turn my brain off , I don’t have to speak to anyone, I don’t have to worry whether the person I’ve gone with is enjoying the movie etc, I can just focus on the film…also, if the films a real tear jerker, which, spoiler alert – this one is, I can just let go and have a good old cry, without fear of embarrassing the person next to me with my constant sniveling! I’ve decided to start a new segment on the blog called ‘Get Lost in Film’ where I have a little chat about recent films I’ve seen, ones that have really stuck out to me, whether good or bad! It’s great when you leave the cinema after seeing a good movie, something that’s original and exciting, or just a great story, or one that made you laugh your head off! Also this will be a great segment for me to look back on because anyone that knows me knows I have a mental block when it comes to films, I basically forget what happens in most of the films that I see and it drives me crazy…literally like even the next day! So…the first film I wanna chat about is Lion, this film really touched me and led me to start this segment because I really enjoyed seeing this movie and I’ve thought about it on and off since I saw it last week. I had seen the trailer for Lion a while ago and thought it looked amazing, it seemed like such an interesting story to me. Any film that is a true story always grabs my attention. If you havent seen the trailer yet, Lion tells the story of Saroo Brierly, a five-year old boy who loses his family at a train station in Calcutta. Saroo struggles on the streets until he’s adopted into an Australian family to start his new life. Twenty five years later, Saroo wants to find where he came from and find his family back in India. With the help of Google Earth (…sounds like a superhero) he starts to retrace the steps he took as a five year old boy in the hope of finding ‘home’. Dev Patel is also incredible in this film, the protagonist struggles a lot with guilt, he feels guilty that he wants to find his family in India because he was given such an amazing life in Australia and eventually his feelings build up and get the better of him. Dev Patel played out Saroo’s emotional struggle really well and you can see how the emotion builds in the character over time. There was a particularly touching scene with Dev Patel and his adopted Mother, played by Nicole Kidman, which I found very honest and very powerful. 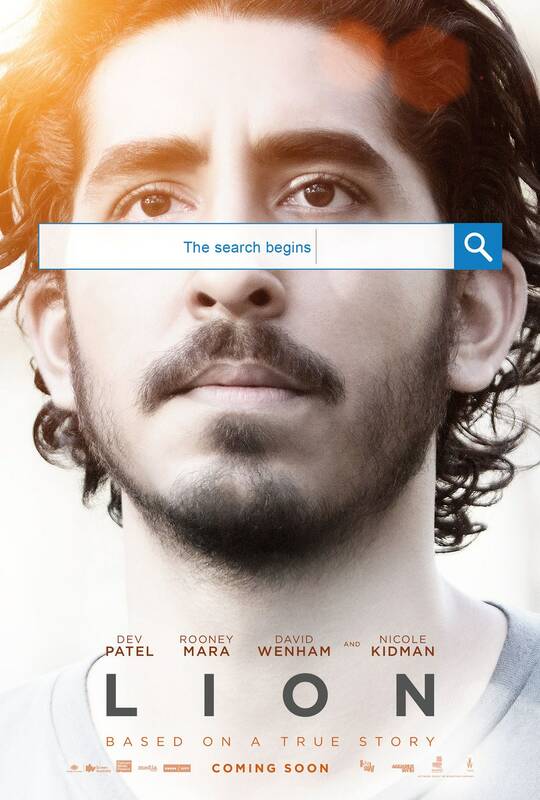 Side note – as soon as I got out of the cinema I googled Dev Patel as I was interested in seeing more of his films (…and have a little snoop on google images…c’mon, he looks gooood in this film!) I was delighted to see that he’d been nominated for the oscar for Best Supporting Actor for this role! This was such a well shot film too, the cinematography was great, the landscape shots in it were beautiful, it really gave you a sense of life in Calcutta and the atmosphere of India. So although this film made me cry like a baby I bloody loved it! The story was so incredible to me that I had to find out about it in more detail so I downloaded the book and started reading it the very next day, the book is great because it goes into a bit more detail about Saroo’s search and his upbringing with his adopted family. I know we’re only in January but this will be a stand out film of the year, for me anyway. The story is one that you have to see to believe, it’s such a heartwarming tale of human struggle and perseverance. The film is two hours long and I can say that I started crying about 10 minutes in and continued to cry on and off for the rest of the film. I’m sorry to the people around me in the cinema, it was embarrassing how much I cried….but in all seriousness, if you watch this film and don’t cry, you’re a cold hearted robot…there I said it. Chick, chick, chick, chick, chicken lay a little egg for me…oh, actually..don’t! I can hardly wait to see Lion. I’ll be looking for more in your ‘Get Lost in Film’ series. Ah thank you, I have lots of films ready to chat about so I can’t wait too!